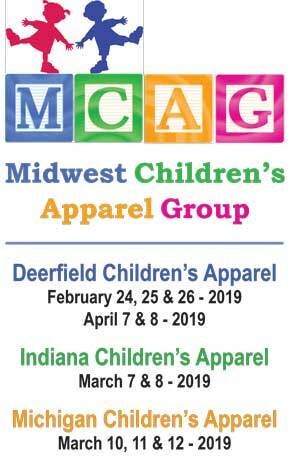 The Midwest Children’s Apparel Group, or MCAG, is the largest organization of independent sales representatives in the Midwest who specialize in selling baby and kid’s apparel, gifts, accessories and shoes. The core strength of MCAG is our annual schedule of regional trade shows in Deerfield IL, Livonia MI, and Indianapolis IN. We organize shows two to four times per year in each city. Shows are held at comfortable Embassy Suites hotels which allow us to offer a showroom setting, and more privacy than booth shows. We also display samples outside of each showroom, which allows buyers to preview the different lines as they walk the show. The Deerfield Children’s Show is held at the Embassy Suites in Deerfield IL four times per year in February, March, August, and October. The Livonia Children’s Show is held at the Embassy Suites in Livonia MI two times per year during February/March and September/October. The Indianapolis Children’s Show is held at the Embassy Suites North in Indianapolis IN two times per year, immediately following our Livonia show. Attending regional trade shows like those organized by MCAG gives buyers the advantage of working with local sales representatives, who understand the product mix that best suits each market – and that means our buyers’ stores are more successful. Please take advantage of our trade shows by being a supportive, loyal attendee. I welcome all ideas and suggestions to make our shows better and more buyer-friendly. Please contact me at tonyvgrimaldi@yahoo.com or (248) 478-1732. Wishing you great business in the coming years.